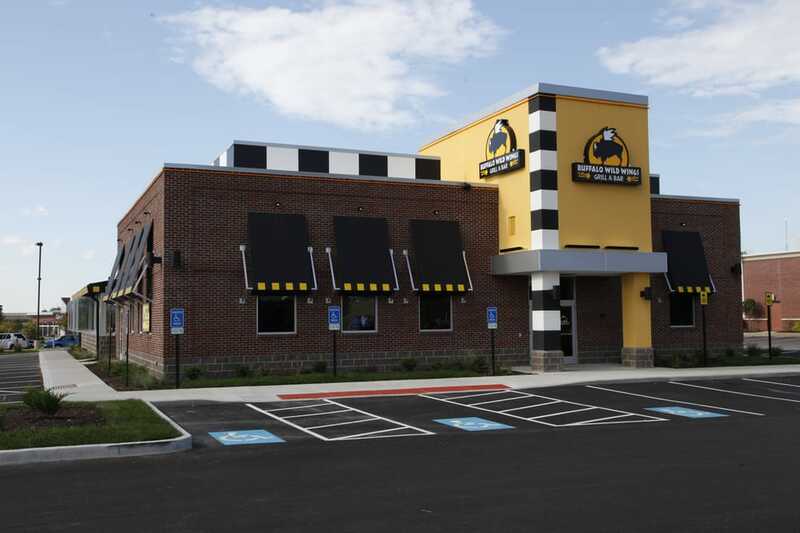 Thanks to a generous donation by Buffalo Wild Wings, 26200 Harvard Rd, Warrensville Hts Ohio, Chagrin Highlands Rotary Charity has an opportunity to put YOU and 5 Friends in the Best Seat in the House to enjoy Great Food, Laughs, and Excitement of watching the 2018 PRO Basketball Finals Playoff Game of Your Choice! Purchase of a $10.00 ticket enters you in a chance to win and helps Rotary fund its local service projects supporting Veterans and Children. Click Here to be taken to our SECURE Ticket Store and make your Credit Card purchase through Squareup. Please share this awesome raffle package with your friends! Our goal for this fundraiser is $2,500 and with your help you can make this happen. Please Note: Members of Chagrin Highlands Rotary and their families are not eligible to enter. 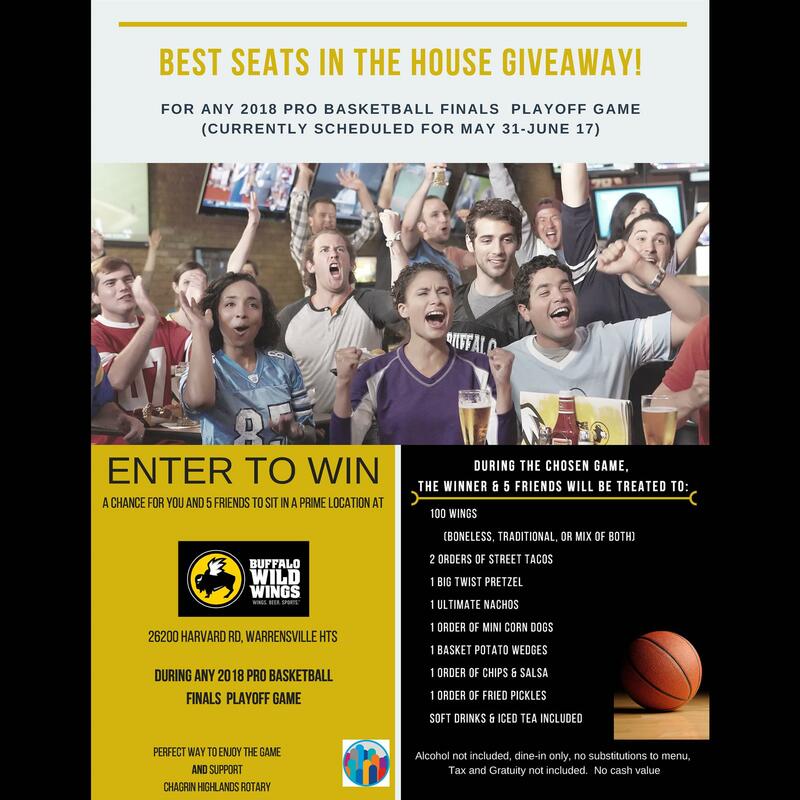 Buy a Raffle Ticket for a chance for you and 5 Friends to sit in a prime location at Buffalo Wild Wings, 26200 Harvard Rd, Warrensville Hts Ohio DURING ANY 2018 PRO BASKETBALL FINALS PLAYOFF GAME (Currently scheduled for May 31 - June 17). Click Here to be taken to our SECURE Ticket Store and make your Credit Card purchase through Squareup. The Best Seat in the House is generously donated by Buffalo Wild Wings, 26200 Harvard Rd, Warrensville Hts Ohio. A Maximum of 250 tickets will be sold and the drawing will be held on or about May 29, 2018. Winner will be notified by email and must contact Buffalo Wild Wings to schedule event to attend. In the event the selected game ( 5, 6, or 7) is not played due to the playoff series ending early, winner can choose any other night before July 15, 2018 to redeem prize. Click Here to be taken to our SECURE Ticket Store and make your Credit Card purchase through Squareup. Members of Chagrin Highlands Rotary and their families are not eligible to enter.